Aaah, August is here, and with it: high humidity and high hopes for the school year ahead! For those of you like me (Kristine of the Kristine and Marjorie duo) you may have already started sketching out how you might arrange your classroom this year. Oh the possibilities! Will this be the year you eek out that extra two feet of space? For those of you that love classroom design, and those of you that wish someone else would do it, I have a few tips on set-up that will help your little readers and writers become independent from day one. 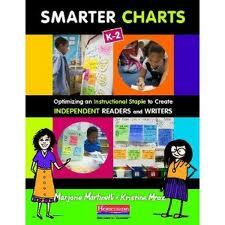 I allotted wall space for reading, writing, math, social studies, and science charts. These spots were left blank at the beginning of the year. BLANK! It would kill me to do it, but I knew that if I was going to make the room truly belong to my students, I couldn’t have the whole thing filled before they arrived. This was where the charts for each subject would go all year long, so when one was no longer in use, it was whisked into retirement to make room for the more urgent current chart. I tried to leave room for about four charts. I put materials in the same space as the charts. This kept things organized for children, so if they needed something for writing, the charts, the materials, everything would be in the same corner. Students also kept folders for each subject in the same area, and those were passed out when they were needed, or children could get them if they wanted to see something in the folder. I kept community supplies on the table. No one could claim they lost a pen when there were ten waiting in a cup in front of them! Play materials were integrated into various subject area materials. Blocks were in math, dress up was in the library with the books, as was the listening center. This was before the smart board, but if I had one, I would have put it where the morning routines were held so we could use this interactive technology when we were on the rug. Last, but not least, no teachers desk. I am sure you, like me, never had time to sit at it anyway, but I kept all my frequently used materials (binder for notes on students, Everyday Math manual, etc) in a basket under the easel, and less everyday things went in the closet. Since the only time I sat was when the students were out at gym or something like that, I would just spread out on one of their tables to do paperwork. Well one more thing, I lobbied very very hard for tables, not desks. It made for more room, and no one ever had to dig around in desks for anything, including me! We would love to hear your thoughts, or see your classroom set-ups! Happy organizing!